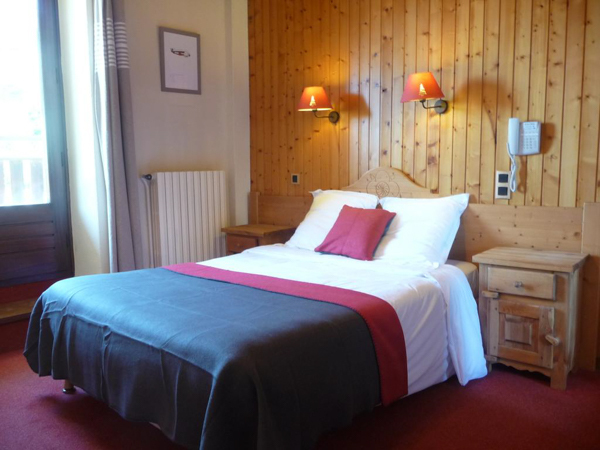 Les Glaieuls, a lovely 2* hotel located right beside the ski lifts of Le Grand Bornand. 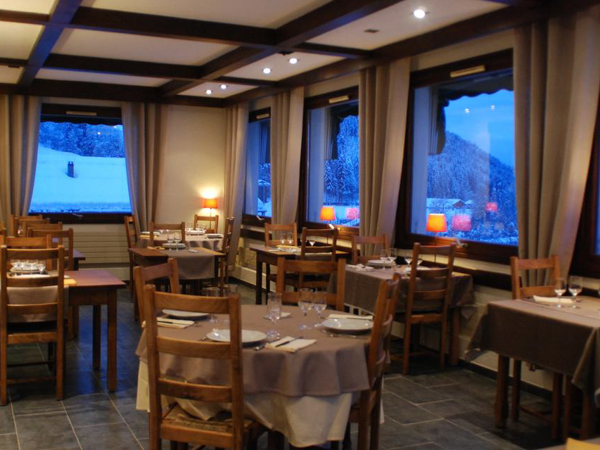 The perfect location to ensure you have maximum time on the slopes, Hotel Les Glaieuls is a small cosy hotel in a quiet location on the edge of the resort. 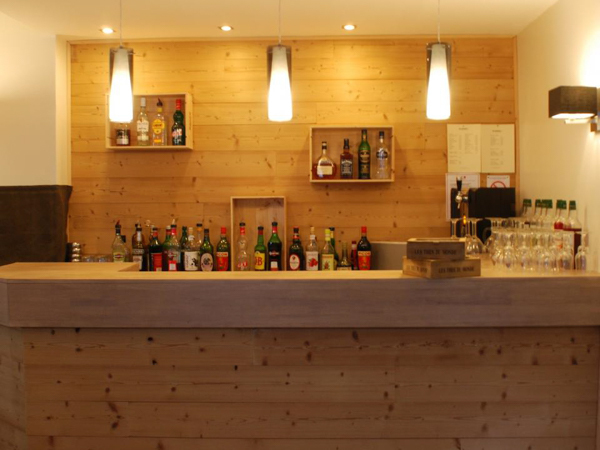 It offers renowned food, ski hire, friendly service and a convenient transport service to the neighbouring resort of La Clusaz. The hotel has 19 ensuite bedrooms, a bar and lounge set around an open fire. After the lifts close and the skiers leave, this is a very quite setting away from the bustle of the village, especially peaceful at night once the lifts have closed. This could be ideal for families who want easy access to the pistes, but peace and quiet away from the main resort in the evening. At the end of a fun day on the slopes, the lounge with it’s open fire is the perfect place to meet other skiers, and discuss the best runs of the day over a vin chaud or local beer. In the evening you can expect to sample some very tasty, locally produced food and wine in the dining room, with full mountain views. Marion and Frank will be your main point of contact and are always on hand to answer your questions and offer great advice on the ski area, resort and local activities. The hotel has 19 ensuite bedrooms on 2 main floors. 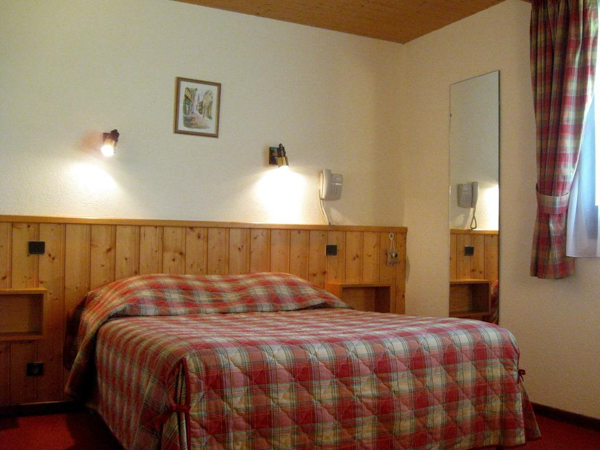 The rooms provide a real ‘mountain’ atmosphere, and are also equipped with a telephone and TV. Many of the bathrooms have been recently renovated. This year’s project is to improve the WiFi signal to all bedrooms. As with most hotels, check out is on the morning of departure – but they offer a room for you to change and shower in after your ski day, and before heading to the airport. 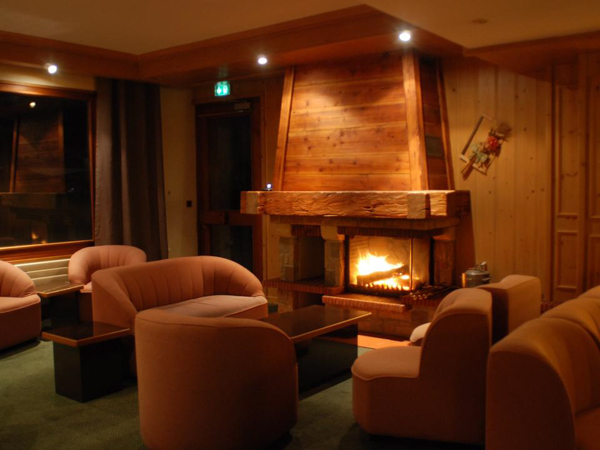 Once the ski lifts close in the evening, Hotel Les Glaieuls, which is set back off the road, becomes a lovely peaceful and quiet place to spend your evening around the fire in the cosy lounge or in the bar, and meet fellow snow enthusiasts. It also benefits from being an easy 5-minute flat walk to the village centre where you can enjoy lots of restaurants and bars. There is an ice rink and cinema which you can reach in a 10-minute walk; during the day you can take the local free ski-bus. The dining room is designed so that you can take in beautiful mountain views over dinner, and the restaurant is highly rated for its excellent food and high level of service. You can enjoy regional wines and dishes made with locally sourced produce. The chef team can cater for all your dietary needs – please ensure you notify us in advance. 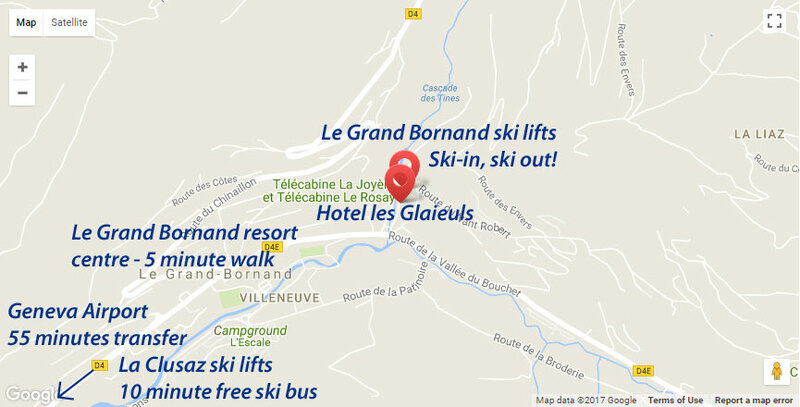 The hotel is located at the bottom of the home run, and right beside the main lift station of Le Grand Bornand. It is just an hour’s transfer from Geneva airport. The hotel is just outside the main village centre, but it’s only a 2-minute bus ride or an easy 5 minutes if you prefer to walk. Regular ski buses to the village (free with your lift pass) leave from outside the hotel throughout the day until 6pm. 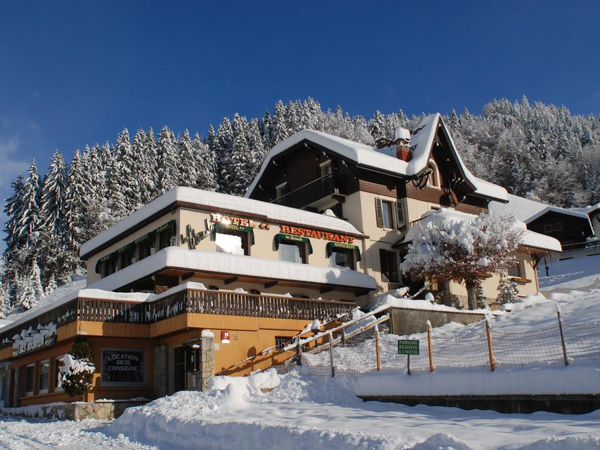 Conveniently though the ski hire shop is located just below the hotel, so you can get set up straight away, no hassle and get skiing first thing the next morning from your door. Once the lifts close, the area around the hotel, which is set back from the main road becomes very quiet. In the village you will find a good range of restaurants, cafes and bars, shops, ATMs, a post office and a mini supermarket. In addition, it is only a 10 minute bus journey on the free ski-bus to the neighbouring resort of La Clusaz, where you can ski another 120km of piste at no extra cost; the lift pass which covers the entire Aravis ski area is included in your package. Plus, the village there has lots going on, with plenty more bars, restaurants, shops and night clubs, should you wish to experience another resort whilst you are there. However, we will still be available and easily accessible to support and help you should you require it! Our Ski Reps will be present in Le Grand Bornand on your first evening so you can meet them to ask any questions, or to use their experience of the Aravis resorts. *Airport transfers on Lite Packages are included for flights scheduled to arrive into Geneva airport between 1500 – 2115, and for departure flights taking off at 1600 or later. On departure, your airport transfer will leave resort 3 – 3.5 hours before your flight time, meaning an evening flight from about 2000 onwards will let you ski all day on your last day. 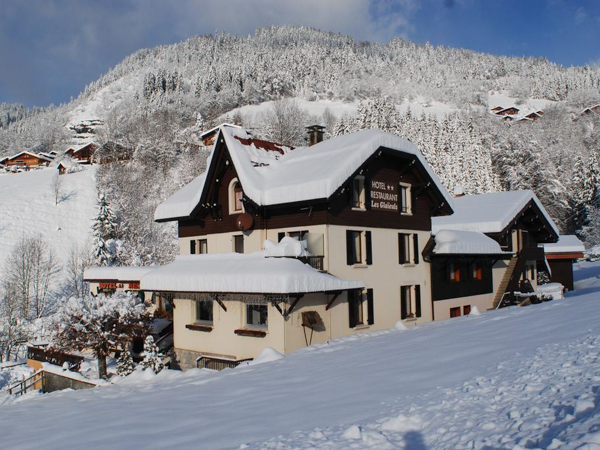 Stays at Hotel Les Glaieuls are possible all throughout the winter season, from the end of December to mid-April. All stays at Hotel les Glaieuls include a full Aravis region lift pass, covering 220km of skiing across the ski resorts of La Clusaz and Le Grand Bornand. Airport transfers are included on standard break start / end dates, for flights scheduled to arrive into Geneva airport between 1500-2115, and depart 1600 or later. Transfer time from Geneva to Le Grand Bornand is just 1 hour. We partner with Paret Sports who are located at the bottom of the telecabines, immediately below the hotel. 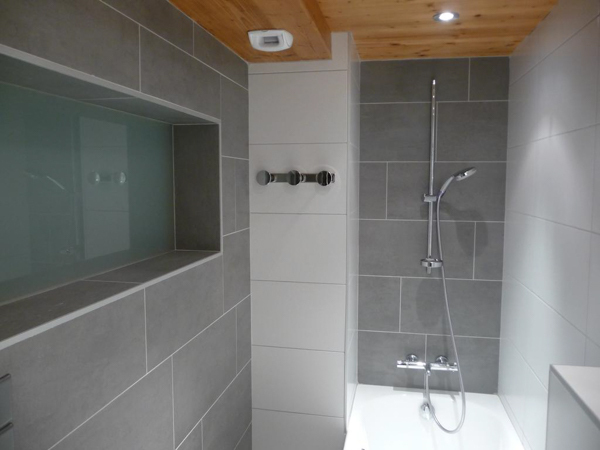 They provide a ski locker facility for our guests, meaning you can walk to/from the ski lifts in your normal shoes. They offer a discounted rate to our guests and you will find Eric and Audrey very helpful. At the Hotel Les Glaieuls, hire of ski jackets, trousers, goggles and gloves can be pre-arranged. Word-of-mouth recommendations are important to us. Click on the TripAdvisor logo to see the many reviews from guests who’ve stayed at Hotel Les Glaieuls. Want to stay at Hotel Les Glaieuls... ?